When embarking on your home improvement journey — as a homeowner — it is your responsibility to have a solid understanding of each and every facet of the project, whether you are dealing with a minor roof repair for your Scottsdale home or a complete roof replacement for your residence in Chandler. 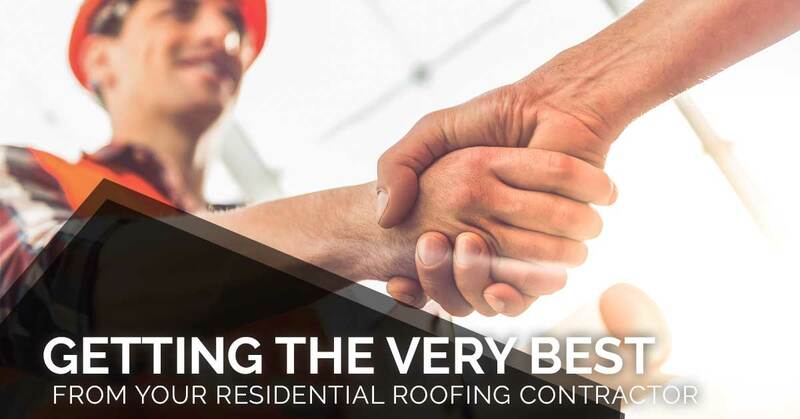 With the effectiveness of your home’s roof at stake, here are some ways to ensure that you’re getting the best work from your residential roofing contractor. Start your roofing project off on the right foot by hiring the best Mesa residential roofing contractor in the area in which you reside. Leaving the job to an experienced, licensed roofing company will ensure that you, whatever roofing services are needed, you will be left with a quality roof over your head. Need help finding the best Scottsdale roofing contractor? Check out some of our helpful tips for your Scottsdale roofing project. Just like with any home improvement project, communication with the contractor is essential. Communication will help prevent misunderstandings and issues down the road. As a homeowner, you should communicate exactly what you want to be done. The roofing company will handle the rest, while also recommending other services or repairs that will increase the durability and longevity of your roof. When you find a residential roofing company to work with, communicate your budget to help ensure that you save on the cost of your project. Communication keeps your contractors in check and makes sure that they are providing quality any additional services that your contractor might do. workmanship while remaining within your vision. Be sure to keep track of any deviation from the agreed upon initial plans. If you are left with more roofing damage than you had to begin with, turning a small roof repair into a complete roofing overhaul, have a record of it will ensure you aren’t met with any surprises once the bill is handed to you. Keeping a record of these changes will ensure that you and the roofing contractor near me who you decide to work with is on the same page. As a homeowner, in short of doing the repairs yourself, being a hands-on is important. During the process of your roofing project, make sure to take some time after each work day to review all the areas that have been finished as well as the areas that still need to be done. Note anything that you find unordinary and discuss it with your local roofing contractor the next day they arrive to work on the roof. As with any venture, the greatest motivator is being treated with respect! When working with your roofing contractor, remember to be considerate and polite to them as they go about their work in making your home the very best that it can be. By taking the above into consideration, you can ensure that you’re getting the best work from your residential roofing contractor. Are you in need of a roofing contractor in Scottsdale, Chandler, Gilbert, Phoenix, Mesa, or the surrounding areas in Maricopa County? If so, you can rely on the experienced team at Express Roofing, LLC. For more information, give us a call!